Lawrence “Solution” Oji was born with the proverbial silver spoon in his mouth. He could have risen to the top echelons of life in his native Nigeria—through the civil service, the military, or the private sector. After a few golden, but squandered opportunities, destiny handed him yet another chance for a fresh start with a university education in New Delhi, India. A star student, he nevertheless managed to plunge into the dark depths of drugs. Early success in drug dealing quickly cemented his own addiction and fueled a jet-set lifestyle that crisscrossed a nexus of leading cities in Africa, India, and Europe. The law caught up with him in Italy, however, completely exasperated by his enslavement to drugs and failed suicide attempts, he returned to prison to find that God was waiting for him with arms wide open. It was Lawrence’s only hope. It was his last option. The star student didn’t fail this time. 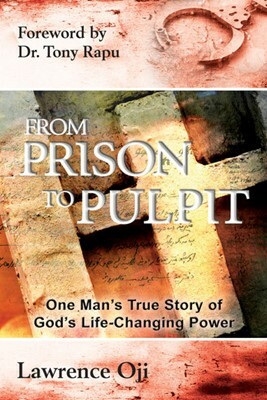 From Prison to Pulpit is the incredible story of God’s unending love and desire to rescue the most destitute and hopeless, regardless of how far they have fallen. Read it and be astonished at the miraculous, transforming power of God’s grace in one man’s life. What a God! It gives me great pleasure to write this Foreword. Lawrence Oji’s powerful story is that of one man who, like many others, resorted to substance abuse amongst other vices in an attempt to find a panacea for life’s pressures. Beyond that, it is the story of the magnitude of transformation that comes from an encounter with the life-changing power of God. From Prison to Pulpit will help others find their way out of addictions. It demonstrates in a vivid and captivating way that God’s love reaches into the darkest pit to rescue us—the masterpiece of His creation. I believe this book will not only help young people see the dangers ahead and avoid the pitfalls; it will also help parents detect the warning signs of substance abuse and delinquency early. It will help each one of us see how vulnerable we can be if our lives are not rooted in Christ. Lawrence Oji found his purpose, satisfaction, and self-worth in God. This book is a must-read, and when you start, you will not want to put it down. He’s now called “Pastor Solution!” Twenty-three years ago, he was “Mr. Problem!” Everyone—parents, relatives, friends, and pastors—had all but given up on him. Why? He was hooked on every imaginable drug and had literally lost every right to decent company; he was broke and so hungry that he even sold a Bible given to him as a gift in 1990 just to have another fix of cocaine. By 2001, he had spent time in many prisons and ended up in a high-security jail in Italy, awaiting deportation to Nigeria. Then suddenly, when all hope was lost, the unexpected happened! Jesus the Savior reached down into that cold Italian jail, picked up a man already judged as dead among the living, and transformed him into a vessel of honor. Suddenly, the man who not only fed on but peddled all sorts of drugs in the dark places of Lagos and Italy became a new creation, born of the Spirit of God, totally abandoning the life of drugs and now leading people away from drugs to Jesus. I could not help but shout, “What has God wrought!” (Num. 23:23). My “theology” about how God would save a soul and who is “qualified” for ministry has undergone a drastic paradigm shift after seeing Lawrence passionately witness to prisoners, prostitutes, and drug addicts in the streets of London with outstanding conversions.